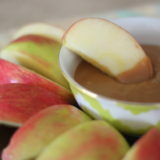 Homemade caramel apple dip that's a cinch to whip up. You won't believe how easy it is to make - and even easier to eat. There seems to come a time in many bloggers’ careers where they have a lapse between posts, then a bigger lapse, then a huge lapse… and then comes The Post. The Post, drenched in guilt, apologizes for the absence. It explains what the heck is going on. It promises to do better. This is kind of The Post. Though I don’t think an apology is in order, because I’m not delusional enough to think that any of you wonderful readers have been on pins and needles waiting for my next post … but if that happens to be the case, my gosh, I love you – and indeed, I am sorry. So what the heck is going on? Well, first of all, over the summer The Hazel Bloom got hacked. Not implant-a-virus-on-all-readers hacked, thank goodness, but the site’s been pretty messed up. We had to do some upgrades and restores and even though we’re clean as a whistle now, things are still not quite as they were (see: lack of navigation options above; still working on that). Second, in far less annoying news, my guy and I are expecting a bun! As in, I’ve got a bun in the oven, and I’m nearly six months along. Predictions are it’s a girl in there, and we’re over the moon. But I’d be lying if I said I was a champ at pregnancy. It’s been a bit of a rough road and, frankly, I’m just not myself. Exhibit A: The lack of blog posts. So! That’s the deal. I am going to try to post more, but I will probably stop short of promising to do so … just not sure how everything is going to go down … but I really, really want to try. I miss this! And now! 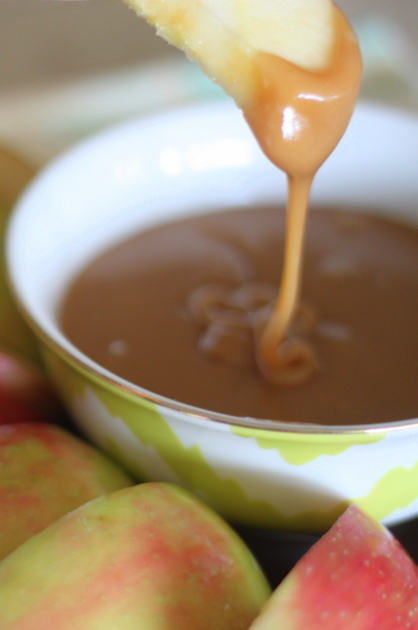 On to the Caramel Apple Dip. Because seriously, that’s what it’s really all about. This is one of those recipes that’s so simple and easy, you wonder what you forgot or what you did wrong. And then you have a taste and you think, if this is the result of me doing something wrong, I don’t want to be right. 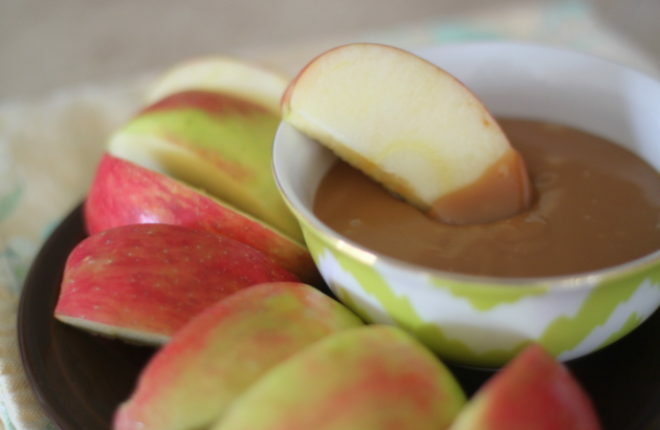 Honeycrisp apples are insanely delicious right now, and I got it in my head that I needed to dip a few of those crunchy, sweet wedges into some caramel dip. And if you have been a pregnant lady, or know one, you know how urgent such a thought can be. And so a little frantic Googling turned up this terrific recipe on a neat blog, An Oregon Cottage. This dip isn’t only shockingly easy, it’s absolutely delicious. It inspired “YUM!” texts from my guy, happy murmers from my niece, a recipe request from my sis and admittedly a little gorging from me (hey, I’m eating for two, after all). It makes quite a bit of dip, enough for several servings. It hardens a bit in the fridge, but just zap it for 30 seconds or so and it transforms back into delicious dippable perfection. Oh, and thanks for sticking with me, dear readers. I love ya! Place the butter in a medium-sized saucepan, and melt over medium-low heat. Add the sweetened condensed milk, brown sugar and honey. Increase heat to medium high and, stirring constantly, bring to a boil. Once the mixture comes to a boil, reduce heat to low and stir constantly for three minutes. Serve with apple wedges and enjoy! Store leftovers in the fridge and microwave for 30 seconds or so to soften before serving. Congratulations on the wonderful news !!! I was waiting on pins and needles :). Glad you’re back and congrats on the wonderful news!! Hey, congratulations!! I love your recipes and pictures, good luck with your impending delivery! Glad you reposted this on Facebook – missed it the first time. Really easy recipe and sooooo yummy. Turned out very well – great taste, nice and smooth. Made this last night to drizzle over an oatmeal apple bake and it was perfect.